In the clip, Mr Sarkozy offers apologies to journalists for being late and then pauses, as if on the verge of laughter, before inviting questions. Boever said the remark was made in jest, and that he apologised "for the proportions that this is taking". "I obviously did not want to offend French national sensitivities, especially since I am also French through my mother," he added. A spokesman for the president declined to comment, saying "it is not common practice... to comment on bad taste jokes". 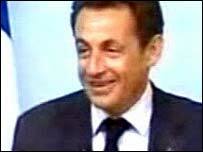 Mr Sarkozy, who was making his international debut at the summit, says he does not drink alcohol and is a long-distance runner.